We had been blessed with lonely ridge, dancing becks, quiet forests and incredibly picturesque lakes. We also had a couple of delightful passes to get over before we were back at our starting point and cars. 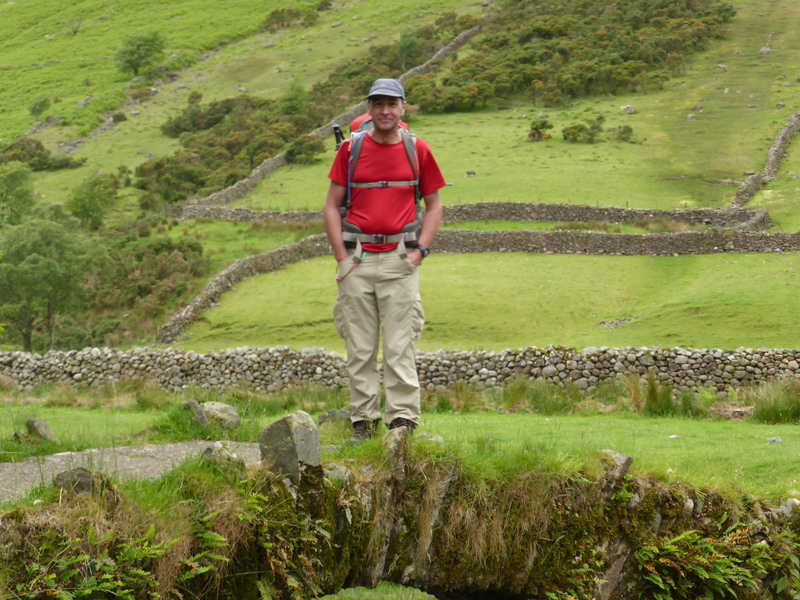 So after being blessed with an evening in The Bridge at Buttermere, our last day was a good walk back to Wasdale Head. With a long drive ahead, back to London and Kent for the southerners, we didn’t hang around on our last morning. Early morning rain had greeted us, so we breakfasted in the nice hut provided for DofE’s at the campsite. The rain eased off as we headed around the lake. 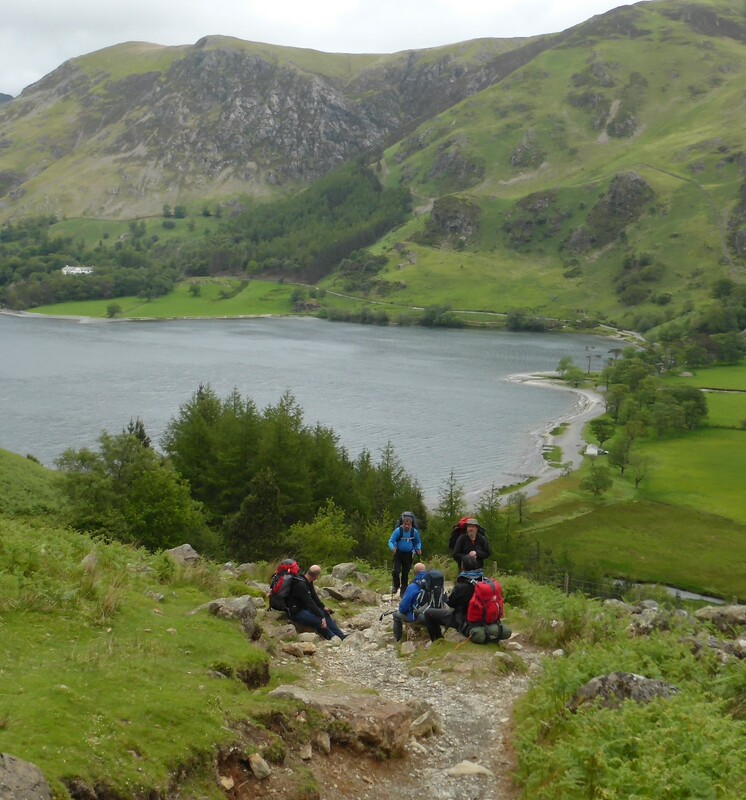 Clouds lifted from the head of the valley so we took time to ease the rucksacks off and take a few photo’s of the always delightful Buttermere head, with Fleetwith Pike around to Haystacks now clearing. First Stop on our way up Scarth Gap Pass. Heading up Scarth Gap was the start of a morning of hard hill climbing. It’s not far up there, but a bit of a sweaty slog. Our gear should have been at it lightest, but all the superfluous kit really weights more on the last hills. I got through this exertion by recalling Julia Bradbury climbing up this path to Haystacks. (A personal favorite of mine from her BBC series Wainwright Walks, you may have to watch it again to understand how this works). Soon we were at a strangely deserted Black Sail, but it was after 10:00, kicking out time. Hostellers would now be out on the hills. Black Sail Pass now loomed above us. Depression was mixed with sadness as we considered the final hill to climb, blessings would only come afterwards. But it had to be done, taking rests and breathers until we eventually reached the gap and looked down into Mosedale. Clouds drifted across the summits of Scoat Fell and Red Pike, our route of a couple of days earlier. Starting up Black Sail Pass. 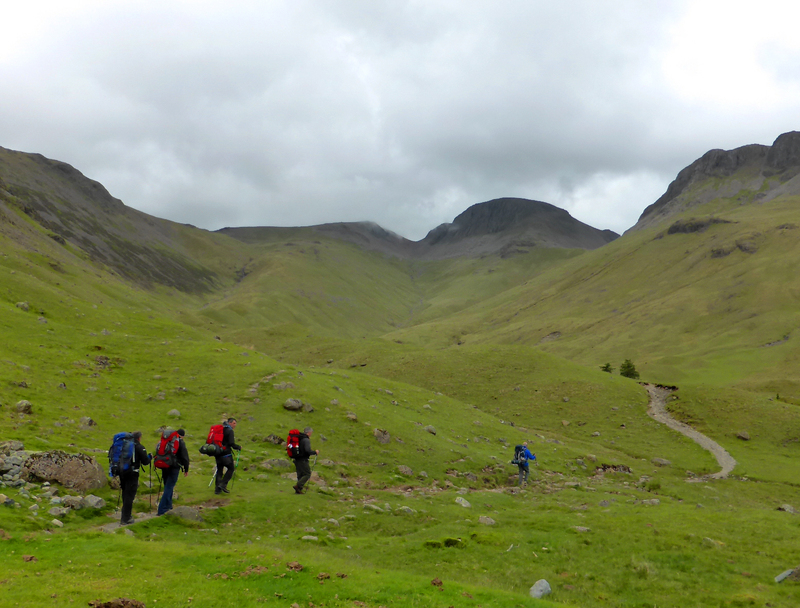 The track up from Wasdale Head was now busy with day walkers, making their way to Pillar or Kirk Fell. We were now on our final stretch to the hotel and car park, enjoying the exhilaration of going downhill, with the end in sight. 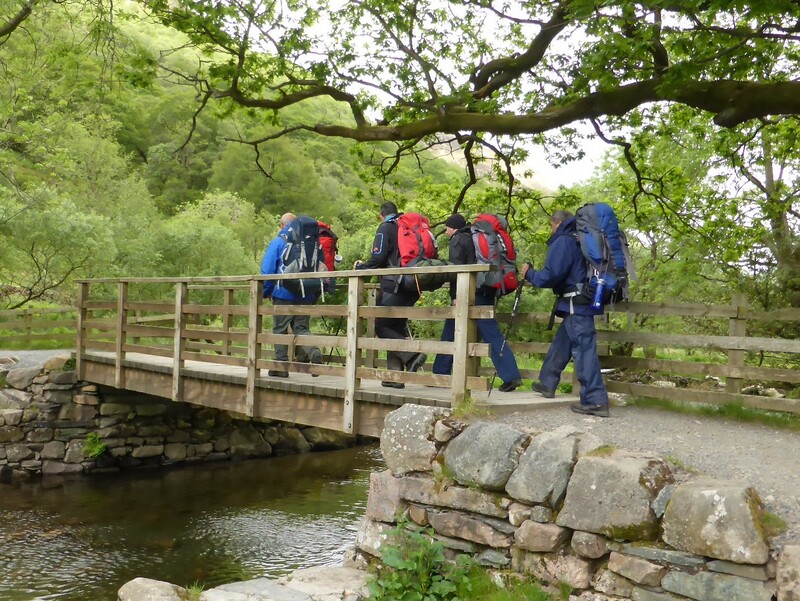 Once at Wasdale Head, it felt strange to walk past the hotel bar, but the journey home loomed and the lads wanted to get back for dinner with their families. At the car park gear was sorted out, the kitty balanced and cars loaded. We said our cheerios, looking forward to the next meeting, which for most of us is our trip to the Dolomites. Nas getting some encouragement from Steve on last pull up Black Sail Pass. This was a great few days, real challenges, wild camping, backpacking and great comradeship. We learnt a lot about our fitness, gear and each other, and it was my first big trip following my operation. Finding a campsite with a pub attached at Buttermere! Ennerdale Water evening view as clouds lifted and Barn Owl floated past. Getting to Grike summit, after leaving the pack at the pass. First sight of a Jetboil – so quick to brew up a cup of tea. Early evening in the mist beside Scoat Tarn, standing with a smile – out in the wild. Getting to a real toilet (enough said). That wasn’t me either. Not all our toes made it through unscathed. Too much weight in packs, they hurt. Lunch in the rain on day 2. No views from that long walk down Caw Fell. Mossies at friday night campsite by Ennderdale Water. 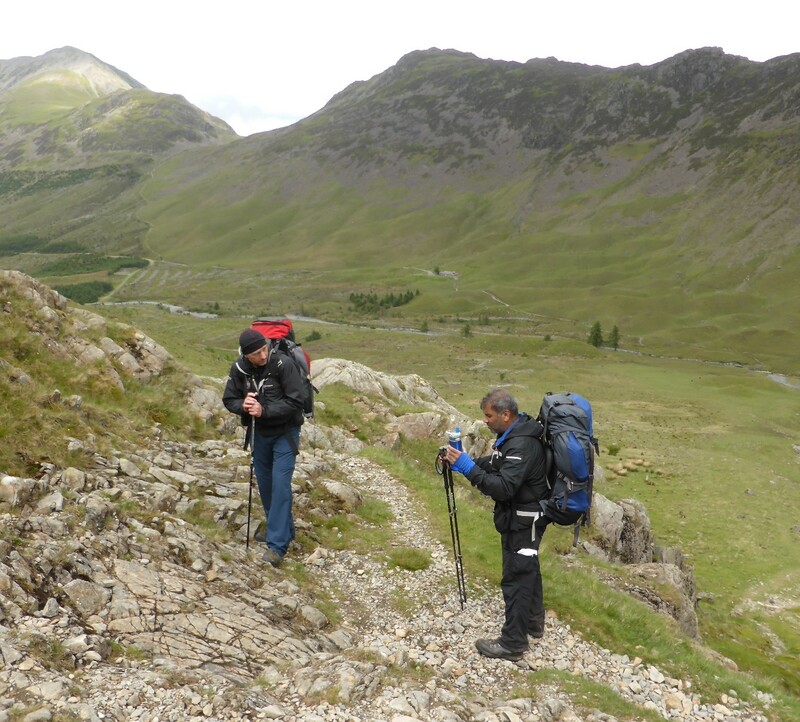 This entry was posted on August 6, 2015 by antondotreks in Blog, Expeditions, Lake District and tagged 2015, Backpacking, Lake District, Wainwrights.